Just a note that, last I heard, there were still tickets available for the extension of Chase Padgett’s Fringe hit 6 Guitars, which has sold out its previous performances. 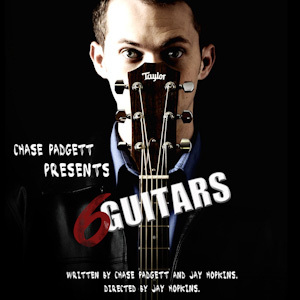 Chase Padgett must be flying high: His production of 6 Guitars, which sold out at the Fringe, has sold out again for this weekend. So he’s added three more performances at the Lowndes Shakespeare Center in July — 8 p.m. July 23 and 24 and 4 p.m. July 25. To make reservations, call Chase at 407-965-2755 and he’ll take care of you. 6 Guitars will be at the Shakespeare Center next week Friday and Saturday the 18th and 19th at 8pm and Saturday the 20th at 4pm. Tell all your friends. Tickets cash only at the door. I’ll post more info if I get it.